On that evening, more than three decades ago, when he invented 3D printing, Chuck Hull called his wife. She was already in her pyjamas, but he insisted that she drive to his lab to see the small, black plastic cup that he had just produced after 45 minutes of printing. It was March 19, 1983. Hull was then an engineer working at a U.S. firm that coated furniture with a hard plastic veneer. As part of his work, he used photopolymers — acrylic-based liquids — that would solidify under ultraviolet light. Hull thought the same sort of process might be used to build a three-dimensional object from many thin layers of acrylic, hardened one after another, with targeted UV light from a laser beam. Hull pursued his research on nights and weekends until finally sharing his eureka moment with his wife, Anntionette. “I did it,” he told her simply. Hull took out a series of patents on his invention and went on to co-found a company, 3D Systems, that remains a leader in the field. Last year, the 75-year-old was inducted into the National Inventors Hall of Fame. Hull’s invention launched a wave of innovation. Design engineers embraced 3D printers as the answer to their prayers: Instead of waiting weeks or months to have new parts produced, they could design them on computers and print prototypes the same day. 3D printers have since evolved and can now use all kinds of materials, including metals, ceramics, sugar, rubbers, plastics, chemicals, wax and living cells. It means designers can progress rapidly from concept to final product. Advances in the printers’ speed, accuracy and versatility have made them attractive to researchers, profit-making firms and even do-it-yourselfers. The cost of the machines has also dropped dramatically, which means it’s easy for home inventors to enter the field. Home Depot sells a desktop version for $1,699 while Amazon.com markets the DaVinci Junior 3D printer for $339. The machines have been used to print shoes, jewellery, pizza, cakes, car parts, invisible braces, firearms, architectural models and fetal baby models (based on ultrasound images). The wave of innovation triggered by the 3D printer is only now beginning to crest in the field of medicine. Researchers are racing to engineer implantable livers, kidneys and other body parts with the help of 3D printers. In Canada, scientists are using 3D bioprinters as they work toward creating new limb joints made from a patient’s own tissue, and implantable skin for burn victims. 3D printing – the future of global food? Is 3D printing the future of global food? A few weeks ago, Londoners were able to eat at the world’s first 3D-printed pop-up restaurant. In early June, a German-based company introduced the word’s first plug-and-play food printer, which may be ready for shipping as early as next year. With the cost to produce this technology dropping, making it increasingly accessible, 3D printing could fundamentally change our relationship with food. Simply put, the process uses ingredients to generate three-dimensional meals by placing layers of compounded food on top of each other. Since 2012, the food industry has used this technology to produce products, including candy, chocolate, pizza, noodles and even crackers. Despite its relative novelty, many companies are recognizing its potential – and recognizing how 3D food printing can revolutionize our global food systems. In particular, 3D printing could radically alter food production practices by enabling companies to manage resources more responsibly and reduce waste across the food continuum – whether you are a processor, a distributor or a consumer with leftovers. Indeed, many well-known agribusiness corporations have already dedicated a great deal of time and research on 3D systems. There is a potential benefit to consumer health, as well. For example, PepsiCo recently announced that it is using 3D printing to develop a healthier potato chip. 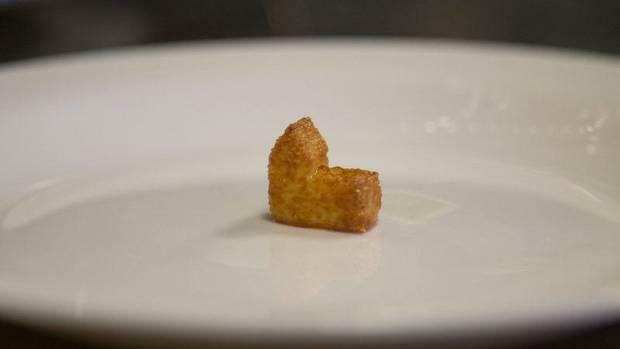 Beyond manufacturing, 3D printing could also boost culinary creativity by allowing renowned chefs to create shapes and forms that were previously thought impossible. Some have argued that it can give the food-service industry the ability to customize products based on individual nutritional needs. Given the demographic challenges we face in coming decades, this can become a key benefit. In Germany, many nursing homes already produce a pureed 3D-printed food product called smoothfoods to residents who have difficulty ingesting food, or even chewing them. Regular smoothies have been on the menu, but haven’t proved as popular. Elderly residents eating smoothfoods can receive all the nutrients they require while enjoying an aesthetically pleasing meal. As a result, they can live healthier, higher quality lives. More significantly, some experts believe 3D printing could effectively address global food security challenges. Ingredients such as algae, duckweed and grass could be imbedded into familiar dishes. A recent study in Holland added milled mealworm to a shortbread cookie recipe through 3D printing – most would agree that a cookie-shaped food product is much more appetizing than the look and feel of a worm. By using insects and other protein sources, the growing need for protein the globe is currently experiencing, which adds increased pressure to beef and pork prices, could be mitigated. 3D food printing does still face major obstacles. The technology remains expensive and complex. The engineering required to produce food is much more sophisticated than producing objects with metal and plastic. Food scientists acknowledge how difficult it is to effectively make edible meals in 3D food printing – ingredients in food interact in many complex ways, particularly with meats. At this point, 3D food printers are not known to produce great tasting food, and still do not have the overwhelming endorsement of the culinary world. However, the technology is improving at an incredible pace, allowing us to believe that very soon, anything might be possible. The concept of 3D printed food is foreign to many of us, and may challenge our collective appreciation of where food comes from, and how it is produced. Let’s face it – when it comes to food, we are all traditionalists to some extent, protective of our food heritage. Printing food is a drastic departure from the art of cooking as a way of celebrating nature’s bounty. But the reality is that in just a few years, we will have more than nine billion people to feed. One way to responsibly address global food security challenges is to consider technology as a primary source for sustainable solutions. Treating alternatives to established food production systems as mere fads may not be the best approach. 3D printing with Easy Cheese ! Delve into the complicated and messy world of spray-cheese 3D printing as a maker attempts to produce gooey cheese forts and cracker toppings. No, it’s not an April Fools’ joke. Innovations in 3D printing are coming fast and furious these days. There seems to be particular interest in food-related printers capable of making anything from pizza to pancakes. But the world has really been crying out for a spray-cheese printer, and now we have one in the form of the Easy Cheese 3D Printer. The printer uses a special mechanism to trigger the cheese can while the print head moves around to position the cheese in the correct location. At least that’s the idea. It doesn’t always go as planned. Sometimes the trigger puller slips off, resulting in no cheese being dispensed. Sometimes the cheese bubbles up around the print head, creating a gooey mess. There are a couple of minor moments of triumph. The printer does a decent job of squeezing a mound of cheese out onto a cracker, though it fails to cleanly disconnect the cheese stream. It also creates a passable spray-cheese fort in the form of a square with layers of cheese. Let’s face it, this innovation isn’t likely to attract NASA’s attention. The experiment comes from the creative mind of Andrew Maxwell-Parish, manager of the Hybrid Lab at the California College of the Arts. Previously, he designed an interactive tip jar called the Wu-Tang Can and a High Five Camera for capturing high fives with strangers. Suddenly, the Easy Cheese 3D printer concept doesn’t seem so out there anymore.